For Joanne Powell, no two days are the same. Joanne is the Research Farm Supervisor for the large animal unit at Rutgers University. Having grown up on a farm herself, she appreciates not only the rewards of a hard day’s work, but also being able to spend time outdoors with animals. We recently reached out to Joanne to ask her a few questions about herself, the swine industry, and opportunities for young people interested in careers in agriculture. This is the first part of our Ask the Expert profile of Joanne, focusing on her early life and what career opportunities are out there for young people interested in the swine industry. I am from Bridgewater, NJ in Somerset County. I grew up on a dairy farm that processed and sold our milk right off the farm. My parents always kept some pigs around to use up old milk and vegetables that were left from the farm store. I went to Delaware Valley College (now University) and majored in Animal Science, with a focus on Livestock Production. After graduation I was hired by the pharmaceutical company Merck, and worked in large animal health research, first in animal care, and by the time they closed the site I worked at, I had been promoted several times up to Research Biologist, working on anti-parasitics in the lab. During my time there I completed a Master’s in Professional Agriculture through a distance learning program at Iowa State. I have been a 4-H leader in Somerset for about 28 years – Branchburg Beef, Dairy, and Livestock and also the Exchange club. Our members wanted to raise swine as a project, so I went to our fair managers and got the space at our fair for them to exhibit their pigs. 2) What got you interested in your field of study? Growing up on a farm – I always enjoyed working outside with the animals. I find animals pretty interesting, and usually entertaining. It is really fulfilling to see an animal you raise go on to do well, whether it is in the show ring, in production, or even when you sell it for meat, and the customer tells you how delicious it was. 3) What do you do on campus? 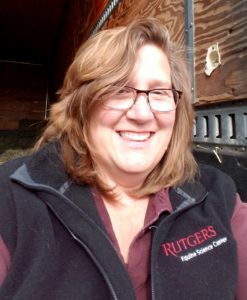 I am a Research Farm Supervisor for the large animal unit – it means I oversee the management of the beef cattle and horses at Rutgers. The beef cattle are new to Rutgers, and that is what I raise myself, so it has been fun to see that program slowly get up and running. The horses are involved in many things – a mounted patrol unit, teaching, and research, so there are multiple things happening with them. I also teach Cattle Practicum – a techniques course that gives our students the opportunity to get hands-on experience with the cattle. It’s important since very few of our students have had any experience with large animals. I also help with the livestock production, livestock evaluation, and farm productivity & analysis courses, and coordinate our farm tour program. 4) What career opportunities are there for young people interested in the swine industry? There are careers available in animal research – that might be a bit non-traditional in terms of swine industry jobs, but the pig is used extensively in both human and animal research. Pigs are a great model for human research because physiologically they are remarkably similar to people. There are jobs in feed sales, equipment sales, and of course in raising pigs. New Jersey is fortunate in some ways to be as densely populated as it is because it gives producers a huge customer base – many of whom are willing to pay a premium for locally grown foods. There are large swine operations in PA, MD, DE and VA that hire folks to work or manage. There are actually a pretty wide variety of careers out there – you just need to be creative. Stay tuned next month for part two of our Ask the Expert with Joanne Powell where we ask her about trends in the swine industry, what resources are out there for 4-H members, and what her favorite breed of swine is!